The southernmost point in my town is a place called Gooseberry Island (or Gooseberry Neck if you’re one of those people). It’s connected to the mainland by a small causeway and is as far south as you can get by car in Massachusetts without rolling onto a ferry to Martha’s Vineyard or Nantucket. Before the construction of the causeway, which occurred in several iterations between 1913 and 1924, the island was only accessible by walking across a sandbar that would surface at low tide. Even this could be daunting. The island sits right where Buzzards Bay meets Rhode Island Sound, so waves come from two directions. There were once plans to develop the island into a resort community, but the Great Depression and the Great New England Hurricane derailed them, thankfully. During World War II, German U-boats wreaked near-daily havoc in Atlantic shipping lanes. 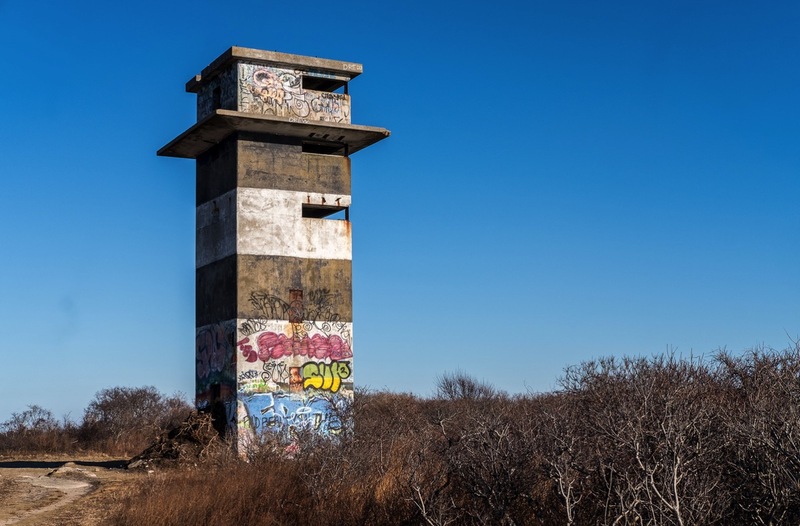 In response, the Army Corps of Engineers was tasked with constructing a series of coastal defense sites, including a stealthy one on Gooseberry Island. It didn’t house any major artillery. Instead, the site was home to several fire control towers with observation instruments called depression position finders. Spotters would use the devices the triangulate the location of enemy ships and phone in firing instructions to artillery locations protecting Buzzards Bay to the east and Rhode Island’s Narragansett Bay to the west. The local network didn’t see much action during the war, but the whole setup was kind of wild. The tower pictured above is actually just the skeleton. Along with its two nearby neighbors, it was camouflaged to look like a coastal farm structure during the war. Many of its peer locations along the coast were also disguised to look like water towers, lighthouses, and other non-military structures. Life is simpler on Gooseberry Island these days. It’s now part of the Horseneck Beach State Reservation. But unlike the main beach area, it’s more of a place to walk around and explore. In addition to its unique history, the island has a lovely coastline and is a favorite stopover point for migrating birds.